HTC has unveiled the One Series of mobile phones, comprising the flagship HTC One X, along with the brand's slimmest device to date - the HTC One S - and the HTC One V, the design of which is based on the popular HTC Legend. Announced at Mobile World Congress in Barcelona, the HTC One X sports a large 4,7-inch Super LCD screen along with a Nvidia 1.5GHz quad-core processor and NFC capability. All three phones will include built-in Beats audio, as found on previous models such as the HTC Sensation XE and the HTC Sensation XL. As well as improving the audio, HTC has taken time to improve the camera offering on its new handsets, with all three including the brand's new HTC Image Chip. This offers a 0.7-second boot-up time for the camera, along with a 0.2-second autofocus that's said to be faster than the blink of an eye. HTC's CEO, Peter Chou explained that : "Our goal is to give you a phone-based camera that gives you the power of a true digital camera on your phone". The new f/2.0 lens has been designed to let in 44% more light than on previous models. HTC will also be offering 25GB of free Dropbox storage for two years, and photos can be uploaded automatically. The One X and One S both feature 8MP cameras, while the 1V will have a 5MP version. 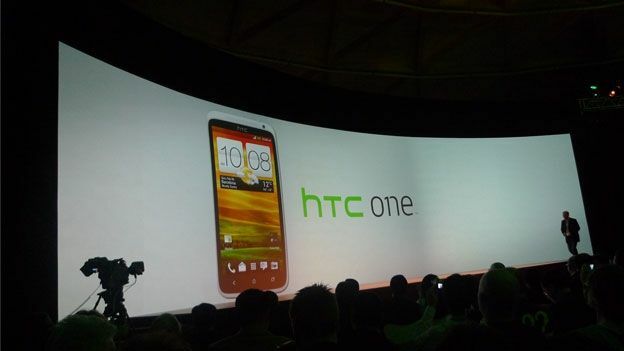 The HTC One S features a slightly smaller 4.3-inch AMOLED screen, protected by Corning Gorilla Glass and at 7.9mm thick, is HTC's slimmest device so far. It also sports an unusual finish on the chassis, produced by "micro arc oxidisation", resulting in a carbonised metal finish that should be sturdy enough to withstand any knocks. An alternative version of the handset features an anodised metal chassis with a dark to light gradated finish. The One S will run on a dual-core Qualcomm Snapdragon S4 1.5GHz processor. Completing the One Series is the HTC One V. Clearly designed as a cheaper alternative to its two siblings, this diminutive handset sports an almost identical chassis design to that of the HTC Legend. However, it sports a larger, 3.7-inch screen and a thinner profile that its predecessor, along with a 1GHz processing chip. All three of the new phones will be packing Android Ice Cream Sandwich along with an updated version of the HTC Sense UI. It will be released on April 5th in the UK, and retail for £497.98. "The important thing is to bring the best technology, the best innovation, to the consumers"
MWC 2019 news and reviews: from Huawei Mate X to HTC 5G Hub to… Nubia Alpha? OnePlus 7: has OnePlus really entombed its next 5G flagship phone in plastic like Han Solo at MWC?